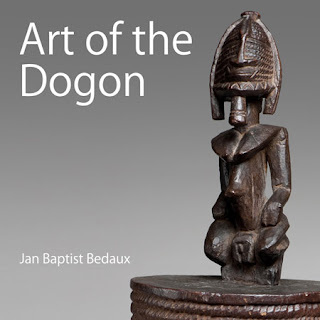 My name is Jan Baptist Bedaux and I would like to tell you something about my new book Art of the Dogon. A private collection of Dogon material culture, Bedaux Art Editions, Brussels 2012, 368 pp, 745 ills. in full colour, hard cover 30 x 30 cm, ISBN/EAN 978-90-818531-0-, that will appear in January 2012. In the summer of 1975 I had my first encounter with the cultures of the Dogon and Tellem. This was at Utrecht University’s Institute for Human Biology, whose exhibition represented over ten years’ research by the institute’s staff in the Republic of Mali in the area where the Dogon live and before them the Tellem. The exhibition showed a wealth of items that had been placed in the caves as grave gifts for the Tellem dead – artefacts that were a constant inspiration to me when I founded my collection. In the same year, I acquired my first Tellem neckrests, which were included two years later in the Tellem exhibition in the Afrika Museum in Berg en Dal. These were soon followed by the first statues, which I bought in Paris from Michel Huguenin, Félicia Dialossin and Robert Duperrier. My 35 years of collecting since then have created a collection that gives a broad view of the material culture of the Dogon and Tellem. In my view, the value of the collection lies not just in its breadth, but also in the sheer variety of items. For, when compiling it, I was always guided by my ongoing fascination with the wide diversities within the Tellem and Dogon cultures. The book contains 745 illustrations and descriptions of 650 objects spread over 368 pages. The cost is 95 € (without shipping). Almost none of the items were ever published before. I am sure the collection will surprise you. For a taste of Art of the Dogon click here (pdf).